The White Mountains are . . . different. As a thru hiker, you’re warned. You’re told it’s going to be a whole new game. But there’s really no way to imagine it until you see it. 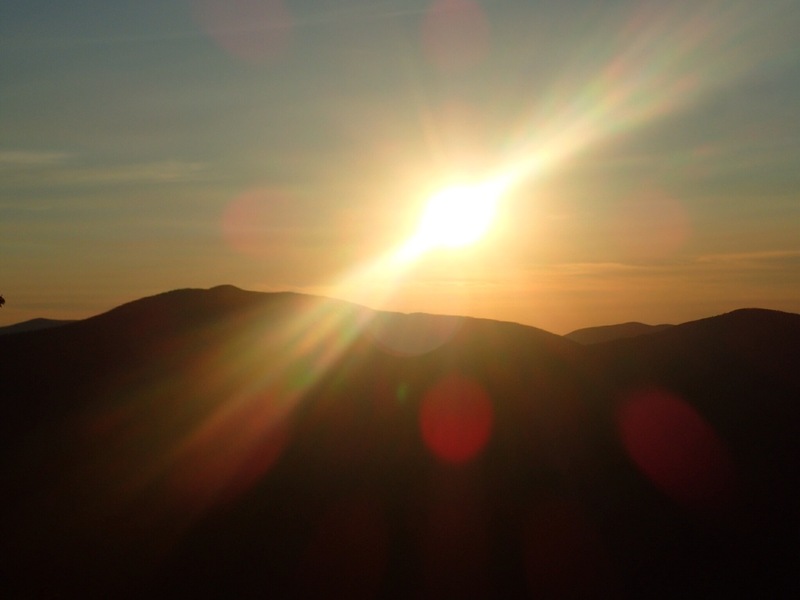 Trails are not trails in the White Mountains. Trails are paths defined by stone cairns. I use the term “path” loosely – generally speaking, little has been done (outside the southern approach to Mt. Washington) to make these walkways anything other than the tumbled down scree they are naturally. I know, I know. It’s hard to imagine. But just think of a tumultuous bed of rocks and stones, haphazardly strewn at impossible angles, slick with lichen and water from fog and clouds. Imagine you’re trekking pole tips sliding an unknown distance every time you lean on them for purchase. Imagine your feet slipping in a similar manner every third step. Now imagine all these rocks and slippery steps ascending 1000′ feet over a horizontal distance the length of the footprint of your house. That’s the Whites. The Whites are also a place you should reread your AWOL (trail guide). I misread mine and thought AWOL’s system of noting trail name changes indicated I too was supposed to change trails. Thinking this lead me to summit Mt. Eisenhower, Mt. Franklin, and Mt. Monroe en route to Mt. Washington. 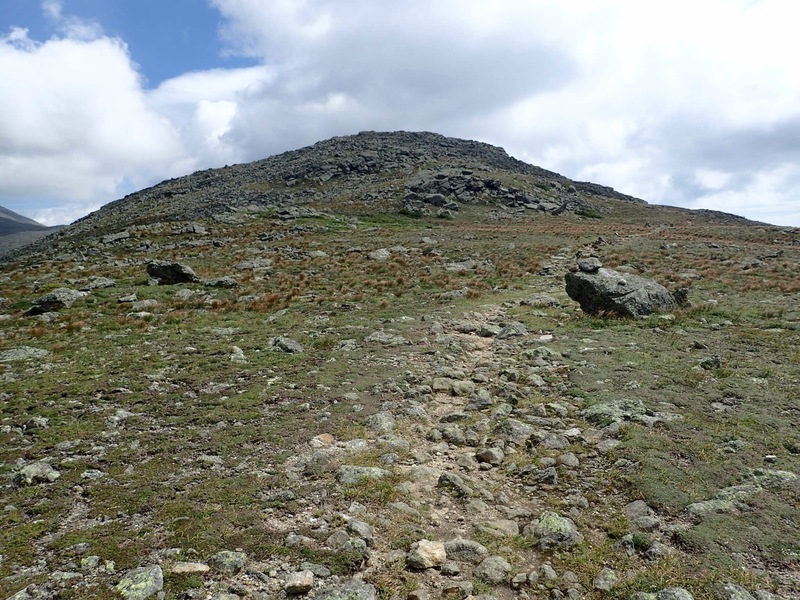 In fact, the AT follows the Crawford Path to the summit of Washington, wending its way around (not over) these ancillary peaks. Now the three peaks I summited were not huge – but figure three extra 500′ ascents and three extra 500′ descents and your heart will go out to my poor hiking legs. 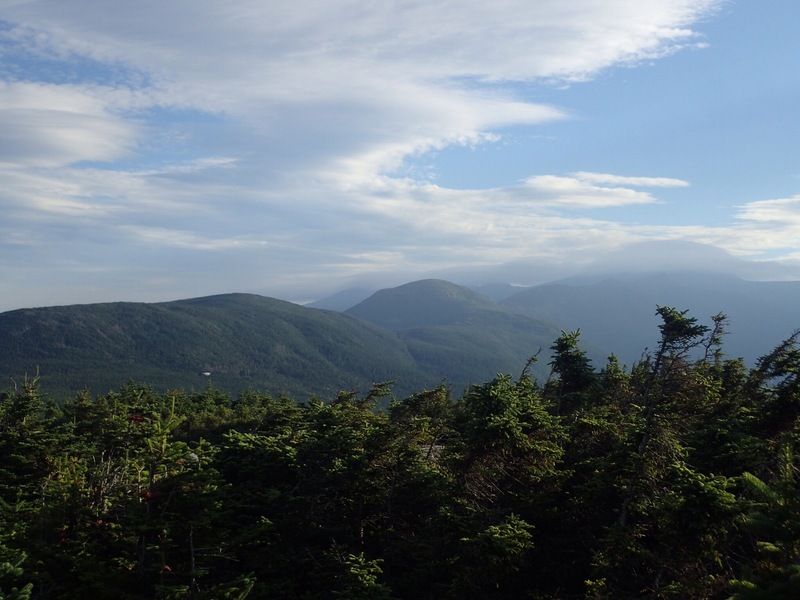 The accidental blue blazing may have been worth it though – the views from the Presidentials are among the best I’ve seen on the trail so far. 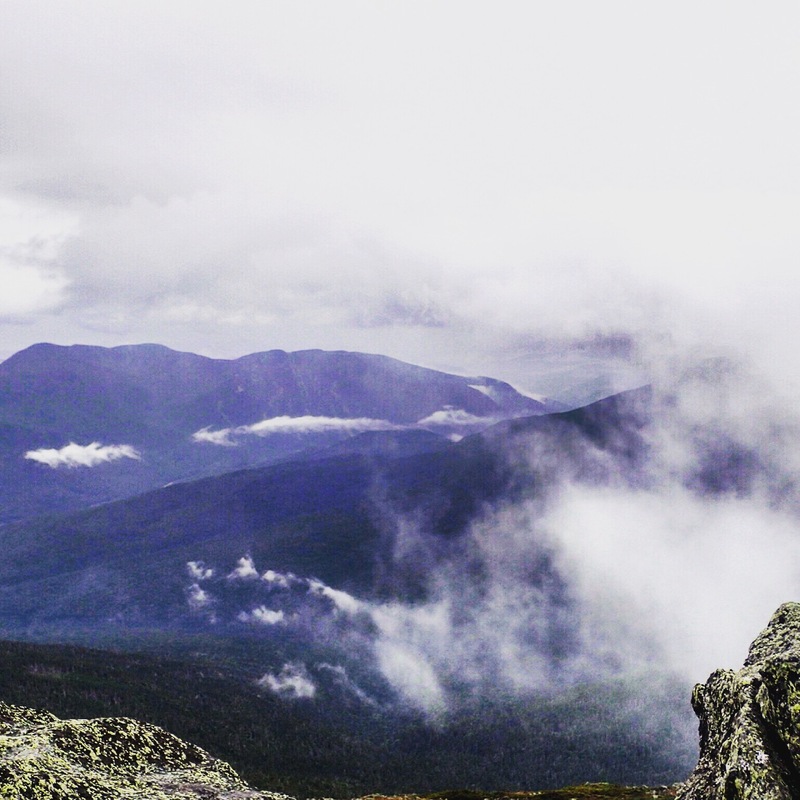 After finally reaching the Lakes of the Clouds AMC hut and eating a dismally small bowl of soup, I finally pushed up Mt. Washington. And you know what? It was the easiest climb of the day. Graded and groomed for “day walkers” (i.e., day and section hikers), the 1000′ ascent was easy as pie. 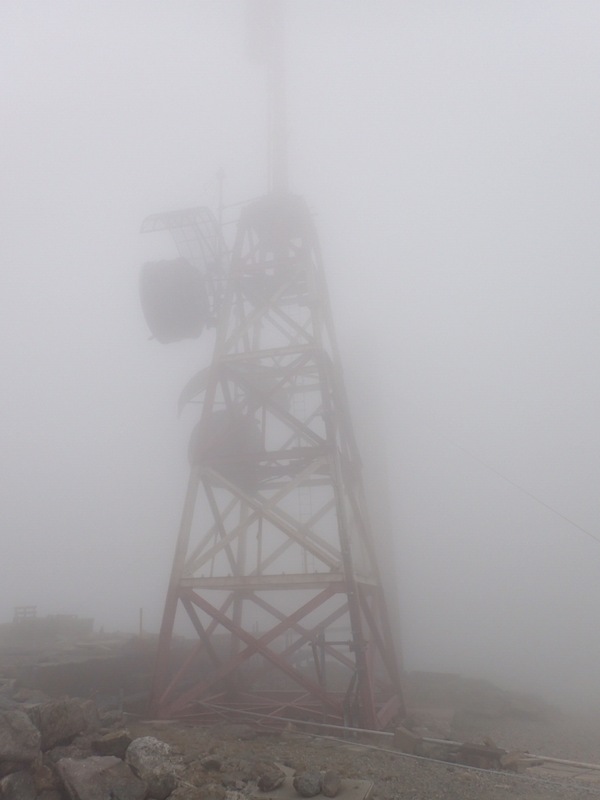 As I hiked up, my far-ranging views were curtailed by impenetrable fog and a strong wind. While unfortunate, it was fun to experience a bit of the meteorological power that makes Washington famous. Once on top of Washington, the circus seems to have come to town! 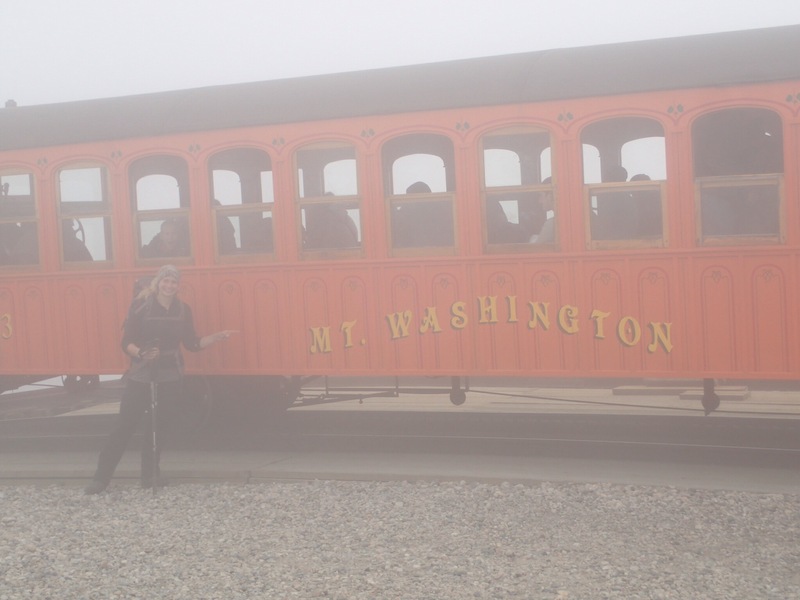 A cog train delivers families to the peak, day walkers hike in from myriad side trails, the weather observation station is manned by scientists and the information desk by friendly Rangers. Hot food is sold from a small concession area and brightly colored t-shirts proclaiming, “This body climbed Mt. Washington,” are sold from a gift shop. All in all, a far cry from the usual summit picture on the AT. After enjoying the amenities, eating a hot meal, visiting the museum, and drinking a hot coffee while talking to my parents, I packed up Baby D (my long-suffering pack) and headed north. Once more unto the breach! Coming off Washington, the trail for day walkers promptly ends. The rock scree reasserts itself and your boots are soon slipping and sliding with frightful regularity. 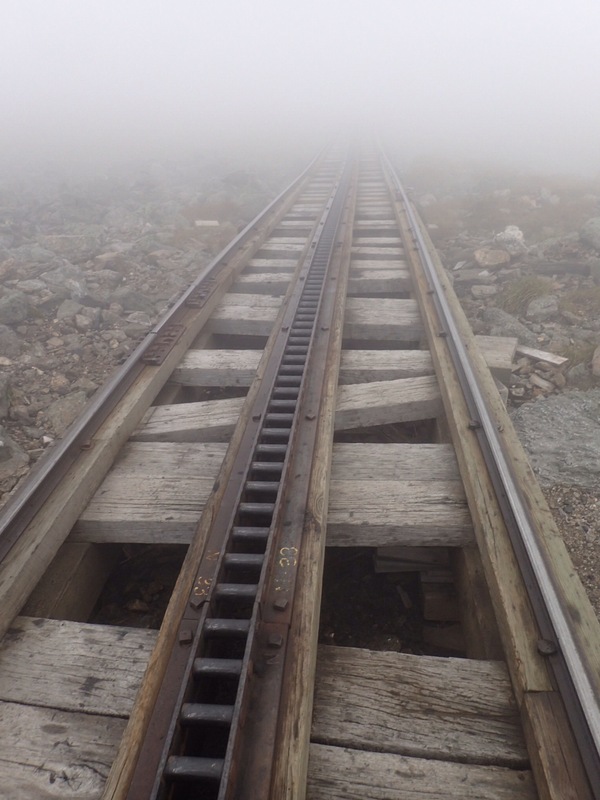 To make matters more treacherous, the cloud enshrouding Washington’s summit thickened to a soup-like fog and the wind picked up in intensity. Stumbling from rock cairn to rock cairn the trail bifurcated multiple times with only poor indications as to where the AT was headed. 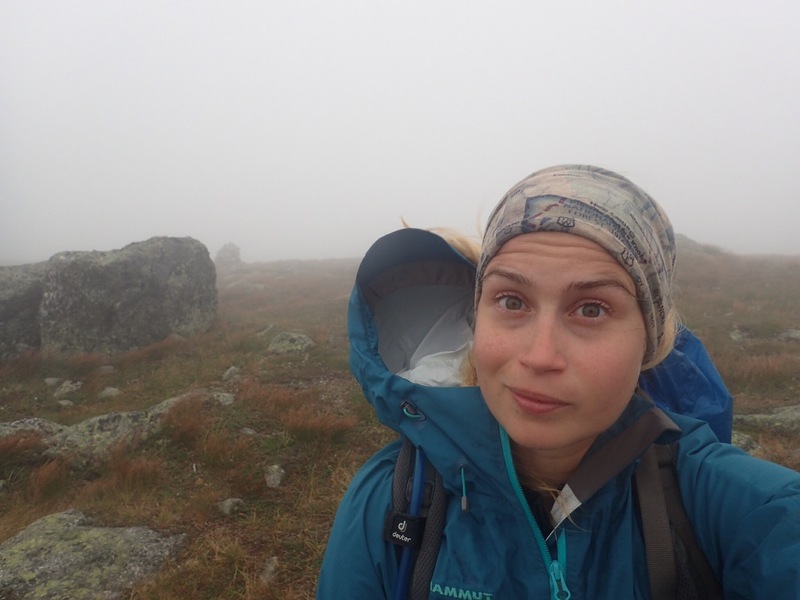 As nightfall became imminent, the fog thicker, and my three-extra-summit-by-accident legs became more tired, I started to look for a flat rock on which to pitch my tiny tent. 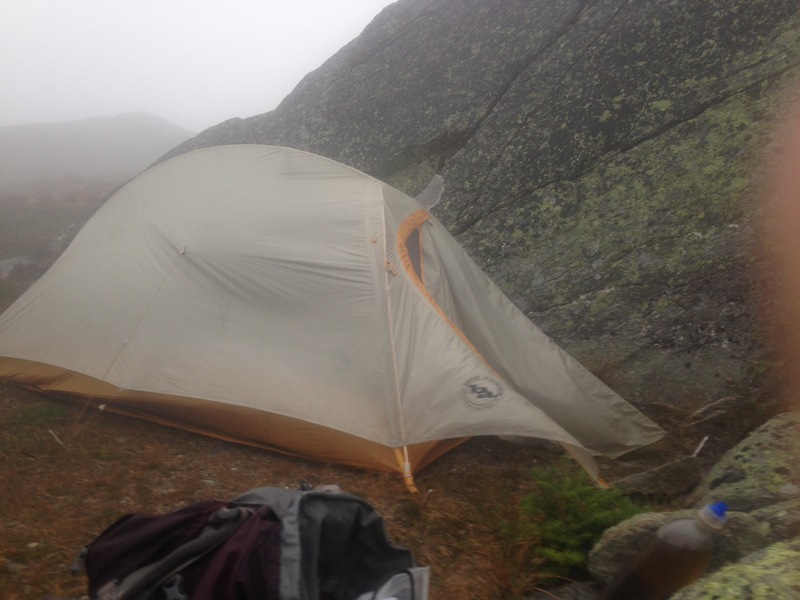 As foggy day turned to foggier night, I happily crawled into my tent. 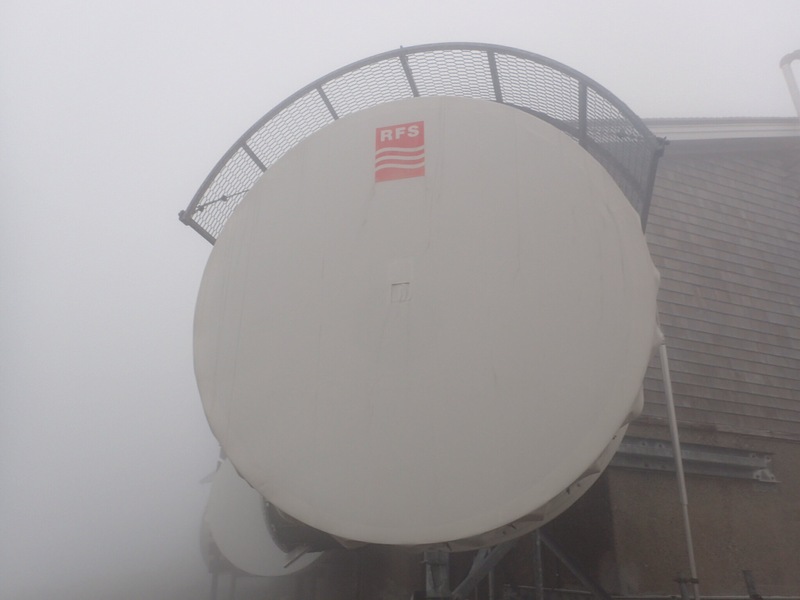 The next morning I continued my trek out of the Presidentials – with even more fog than the night before. An adventure indeed, but an adventure for another day. Love seeing such accomplished people stopping to pursue their dreams. The whites will get you ready for southern Maine. Have a great hike I hope your views are better in the Bigelows. Glad you had an epic adventure in the Whites. We like our rough, rocky trails. They’re even more fun with a coating of ice and snow 🙂 have fun in Maine!